The death of Shalitha Shehan Dasum shattered the hopes of his parents. The demise of Shehan came as a shock to his parents. He was just 19 years old when he died. The reason for this death was sudden heart failure. The parents to date are distraught over this death. Shehan was the son of Krishantha Perera and Lasantha Ranaweera. He had a younger sister named Nethmi. Shehan was an obedient and a lovable child from childhood. He studied up to O/levels at Kalutara Maha Vidyalaya. He was admired by his teachers and schoolmates as an affectionate student. “He studied from year one at the Kalutara Maha Vidyalaya up to O/Levels. He was involved in many extracurricular activities at the school. He played cricket and was a member of both the junior and senior bands of the college. 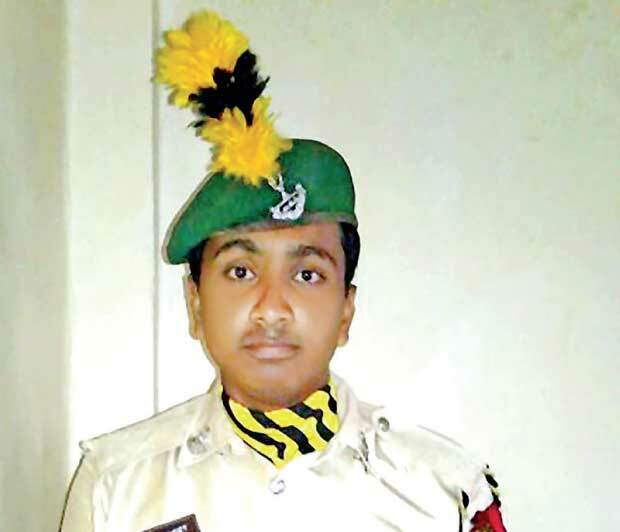 He was a cadet at school and excelled at the O/Level Examination,” said his father. It is now three months since the sudden death of Shehan. But his parents still remember how he was fondled by them when he obtained high marks at the examination. Those memories have now faded away. “My son returned home majestically after sitting for the examination” his father continued adding, “all of us at home were happy. My son always spoke of becoming a lawyer. Later he said that he wanted to enter politics. We never objected. He also wished to become a District Judge or a Magistrate. We admitted him to Royal College for his higher studies and there he joined the cadet troop. He even went to Diyatalawa for training. Shehan loved Art subjects because his aim was to become a lawyer. He loved both of us so much. He also loved his sister. In spite of engaging in extracurricular activities at school he never neglected his studies,” said the father. The father added that his daughter Nethmie studies at Thakshila College Horana. “She too is very good in her studies. I remember the day he returned after sitting for his A levels. He said he is sure of obtaining three A’s and he would not go to school any more. He had jotted down in his books that he would obtain the highest marks in the island and be among the first 250 students,” he said. On the 25th of September Shehan’s father as usual had prepared to leave for office. Shehan as usual had risen before 05.15 am and knelt at his father’s feet reciting the Gatha (stanza) which is recited when worshiping a male parent. The father had hugged him in return and left home for work. Shehan had then returned to bed. Within ten minutes after leaving home the father had received a surprise message. The message said that his son had fallen off the bed. Death had come instantly to the boy. An open verdict was given regarding the death. Later it transpired that during the past month a virus had entered his heart. The result was that his heart muscles had been affected. This condition had led to heart failure. \When the results of the A Level Examination were released Shehan’s parents came to know that their son had obtained three A grade passes. Their deceased son Shehan had realised his ambition. But Shehan was not there to share that joy. These parents didn’t have a son to embrace and celebrate the results of the examination. Dr. Namal Wijesinghe of Sir Kothalawala Defense Academy said that the possibility of small children suffering from heart attacks is rare. “Children may have heart ailments due to various sicknesses, specially due to blood circulation problems. These are very rare occurrences. These conditions may develop in children when they can’t adapt to changes in lifestyle. Examples for these changes are eating habits etc. If such food patterns are not changed as they age they can lead to heart ailments. “At present the likelihood of youth becoming heart patients is more. Several decades ago heart ailments were common only among the adults belonging to the age group between 60-80 years. However, trends changed and we saw people belonging to the age group between 40-60 being affected. Presently there is a trend among those who belong to the age group between 25-40 years becoming heart patients. The lives of those who are trying to earn a living are being subject to untimely death due to heart ailments. The main causes behind this kind of death is lack of exercise, questionable eating habits and mental stress that develops in the midst of severe competition,”said Dr. Wijesinghe.